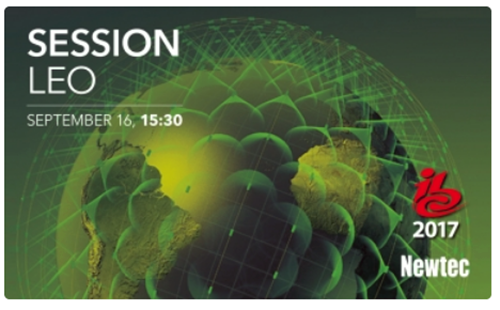 During IBC2017, and sponsored by Newtec, the LEO, MEO: New Orbits on the Horizon session will take place on September 16, 2017, from 3:30 until 4:30 p.m. in sessions room G106, located on the first floor at RAI — check-in for this informative session is at 3:00 p.m.
With the growing prominence of High Throughput Satellite (HTS) platforms and the advent of Low Earth Orbit (LEO) constellations, the satellite industry as a whole is facing a complex set of challenges. Everyone is trying to find synergies between this latest evolution of the payload and their current technologies so they can exploit the increased performance it can offer. An important factor to remember with this innovation in space is that it must be matched on the ground. If the ground segment doesn’t keep pace with the fast-moving HTS and LEO technologies, we as an industry will never realize their full potential impact. Most of these new innovations are disruptive in some way, meaning that this must be reflected in the ground segment technology if the premium services they enable are to be delivered. With so many different technologies in the marketplace, operators and service providers need their ground segments to have this synergy with each of them to ensure that they aren’t the weak link in the chain. Moderated by Susan Bull (COMSYS), this session brings more light into all the obvious questions the industry has: LEO, MEO facts or fiction? When will it happen? What are the applications? What are the challenges?